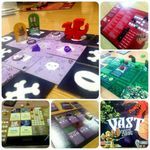 Vast is a fully asymmetric game. Every player is working on really different things even when considering the mechanics. In this game you can become the fearsome dragon which needs to wake up, surface and leave the cave which provides the place for the events. Or you can be the knight whose sublime quest is to kill the dragon. You take on the role of the goblins for which the knight is the one thing which definitely should be removed from the cave... or just killed. But maybe you're the cursed thief who can't be dissuaded from getting treasures, even by his inevitable occasions of dying. If it happens that the only thing bothering you is the noise made by others and the main idea is crushing them with falling rocks, well, then you are (probably) the cave player. The aims and roles can change a bit with varying player counts and also there are additional roles not included in the base game. Backstory is really slim almost missing; the circumstances are given by the graphics and the player objectives, no meat on the bone there. However, this is a thematically consistent game. On the other hand we could not find anything contradicting even though we are quite seasoned in nitpicking. We found narrative for every cause and effect we faced. So here is the controversy: no backstory but very thematic. The game was intriguing even when I did not participate in it just taught the rules to five people... but maybe it's just me, not the game. 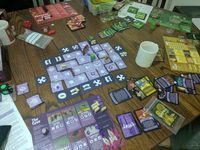 I find it astonishing how very different are the options of each player, notwithstanding how strong the interaction is. It's a matter of to like or dislike the look of the game which I call "intentionally ugly" but it's nevertheless consistent. The same is true for the meeple/standee option one might prefer one or the other (we usually play with the standees). Component quality is above average, the punchboard is exemplary, there's even some kind of finish on the tokens to withstand more than the paper and printing can by itself. Therefore the tokens seem long-lasting but if they get eroded I can't really think of anything when recognizing a token from its backside would mean a lot (maybe the cave tiles, but there are a lot of them with the same back). Cards and other things are good quality, but if you prefer to shield the cards, you should be happy with the common card sizes (65x90). We almost have an insert here... I could not decipher how I should pack the box to hold the contents and support moving around with the box in my pack... I did find a method to pack the box but I'm not satisfied. There are a bunch of unnecessary components in the box (maybe that's only true for the Kickstarter version, I don't know, could find any info on that): both meeple and standee for everything, chests and tokens, firewall token from wood or paper. I don't understand the cause here. The creativity of the Cave player is a main factor in replayability, but the rainbow-like cavalcade of interactions does not show anything to be bored of... even the difficulty settings can change the game reasonable, hence prolonging replayability. None of roles has won with same strategy twice (yet). You don't actually need any expansion for this game, but the +3 roles from the Kickstarter will enhance replayability by orders of magnitude. Game length is quite stable if the players are able to balace well (we were able to that so far) and don't let anyone win very quickly. This starts to fluctuate with lower player count: it's easier to overthrow the balance with 3 players than it is with 5 (but maybe this is just us not knowing what to do with unusual objectives). Nevertheless it is easier to tilt the game your way if your turns are more frequent hence the instability. The very first game is much longer than a game with experienced players because everyone wants and needs to understand the motivations and actions of the others. One should consider preparing for that by tuning difficulty (see later). After gaining experience one game is about 90 minutes in our group but this can seriously change with different combinations of player objective difficulty. So it can be shorter or longer depending on the level but seems to stable for a given set of levels. This game is a continuous engagement of all players, not a lot of downtime even in a game with beginners hence downtime is not factor as this is a way deeper game than your average family game. Setup time can be controlled if you pack all the stuff of each player separately. Setup will be quite straightforward and quick which is quite cool in my opinion for a game of this complexity. Bookkeeping is negligible disregarding the knight's grit track. There are tokens and cubes for everything, but one might mess up the grit track while jostling. In this case you have to put it back based on your recollection. Because of the complexity and amount of moving parts one should do some bookkeeping while learning: keep the order of steps listed on your board to avoid missing something important. There is a lot to learn because of the total asymmetry hence learning the game can get slow. Therefore we can be happy that the difficulty can be tuned using 5 levels role by role. By setting the level of the first game to Easy for all roles a group can get a much shorter game with a more shallow complexity but with the mechanisms remaining the same hence learning about the interactions in a shorter time span. Apart from that, difficulty levels can also be used to mitigate differences between seasoned players and beginners. Language dependency is a factor. For each player 3-4 pages represent the rules in English. It's really concise and (in my opinion) requires an intermediate knowledge of English. If you have a translation for the rules and/or player boards, then only the secret cards of the Goblin tribes player may cause problems (and in some cases the treasures), other things can be interpreted together. There is a slight danger of analysis paralysis here, but a lot of things depend on what the other player will do, so this uncertainty controls is quite well. Learning the game could be helped with some kind of digital application, but otherwise it is not needed, and I would not think that it could enhance game experience. So maybe it is better that there is none (2018.01.03.). The game is stronger in tactics than it is in strategy, just a few players can hold bigger secrets in their hands. Devious surprises can be expected only from the Goblins (Secret cards) and the Cave (unrevealed tiles) (considering only the 5 roles of the base game). Although the others are fine in strength they are easier to measure what to expect from them. Considering strategy, it is difficult to think ahead 3-4 rounds because one of the Cave player's main motives is to disrupt these trains of thoughts and hence efficiency. The role of luck is quite small, although different from role to role. The dragon is almost naked to its cards; on the other hand the random things for Thief are almost entirely derived from the actions of the others. Balance is surprisingly good. There are cards to manage differences but with similarly experienced players the result always was extremely close (even the very first occasions). Considering price point the amount and quality of components (even though they are more than all right) may not imply more than 80% of the price... BUT (and this is a big but) for a game of this kind of asymmetry can mean a horrible amount of testing time which is IMHO a good reason for the price. But maybe I'm not even right on that, and the price is fair and square. Whatever the situation is, I'd prefer this kind of pricing over any type licensing fee paid to Disney or the Herbert-clan. Some table space is required. This is no Trickerion but on a medium size coffee table can cause serious struggle. I wouldn't dare to call this a travel game. NOTE: Based on the rating system used by Zee Garcia of the Dice tower. I don't know where he got it from though. Long story short, yes, very much, gave it a 10 without really thinking about it (using BGG terms: "Will always enjoy playing"), and even after playing more and collecting my thoughts for the review it remained an absolute 10 for me. Exactly my cup of tea... totally subjective of course. I did not state that in this review, I wanted to stay on the more objective side of things but your question (and the thumbs on it) suggests that I should've stated this there. The only real negative for me as I've somewhat mentioned is the really slow learning curve, I even listed solutions for this, but that's all, love the game, wating for the 3 extra roles now. 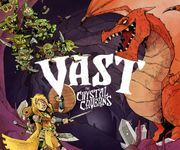 So, to tackle this... when I saw a copy of Vast with a fair price I bough a 2nd copy, and almost bought a 3rd one. A lent it to some of my friends, to try the game (everyone liked it), and sold it on buying price to one of them after all (that was the original plan). This will help with the first steps, I hope everyone I play with gets to play this once or twice.